Some media in the United States have been portraying the people of "the caravan" moving north to its border as ex convicts, criminals, or in President Donald Trump’s preferred vocabulary, “bad hombres.” This collection of photo portraits aims to cast a different and more illuminating light on those who fall in such a trap of a generalization, a mischaracterization that masks, first and foremost, the humanity of mothers and children who embarked on the caravan’s difficult journey. Here, at La Ciudad Deportiva Magdalena Mixhuca, in Mexico City, the smell of sewage fills the air and sickness is everywhere. Children are coughing, vomiting, stained with dried mucus all over. Would they be here if they didn’t have to? Despite everything, they remain surprisingly optimistic, extremely welcoming, and gratefully happy to have a chance at making a new start, no matter how long and far the journey it might still take. Let us be reminded that before the facile labels, overhasty categorization, and false associations, we and they are, in essence, fellow human beings. And once we have -- literally --seen and realized that, let’s start acting on it and mend our ways. I arrived in Mexico City with no specific plan. I knew I was there to photograph the mothers and children of the caravan, but other than that I had absolutely no expectations. I thought, how could I arrive somewhere which is in its nature chaotic, unsure, at a disarray, and impose a certain structure? I preferred to let the environment swallow me right up and spit me right out, leaving me with the ultimate choice to swim, or to drown. 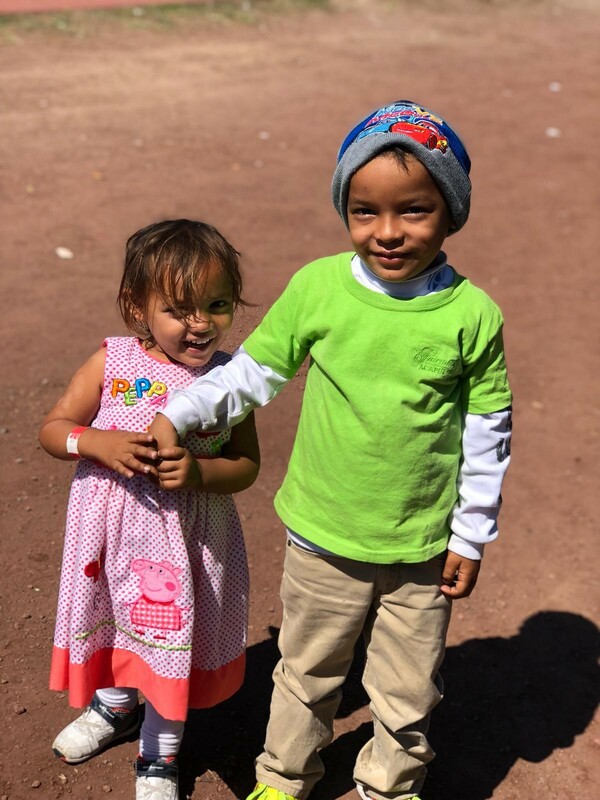 At la Ciudad Deportiva Magdalena Mixihuca, a large sports stadium turned into a center for the caravan people, I found the flow amongst the chaos to be sustained by the caravan’s mothers and children;. I didn’t have to look too deep or too far to come across motherly embraces, looks, handholds, nose cleaning, or attentive lice checking. I developed a technique inspired by human instincts, I simply approached every mother and child I passed, or who passed me, told them of the nature of this project, and inquired whether they would mind having me take their portraits as part of it. I’d say 98% of these women and children not only agreed, but greeted me with a welcoming you wouldn’t expect from one who was met with as many rejections from society and destinations. Karen Macy was one of the first mothers I met at the center. I came across Karen, wearing her pink hat, and her daughter Maria, playing on the swings. Maria was quite unsure of my request at first, to which Karen responded with picking her up, looking at her with a radiating smile full of teeth that one could simply not remain neutral to. The next day I ran into Karen and Maria again, but this time with another part of the family, Yair, a loving son to Karen and brother to Maria. We played, we laughed, we bonded in ways I wouldn’t think only two days would allow. By the end of our conversation, Maria’s head was resting on Karen’s chest, fast asleep, and I was calling Karen Mama. The thought that they, or the friends and partners they made on this journey were attacked with tear gas, violence, and hostility, pains me in ways I cannot express in mere vocabulary. After not being able to pay for the bribes and taxes imposed on her family by gang members, Maria’s house was burned down and her two brothers, who invested all their money in treatment for Javier, were murdered. Javier suffers from Down syndrome and hydrocephalus, a condition during which excess fluid collects in the brain, causing problems with coordination, motivation, organizational skills, vision (notice Javier's eyes), and language. I met the two a few days after Javier suffered a seizure which required a hospital stay and left a mother worried for her child’s life. Can you imagine having overcome life-threatening events and the caravan's journey just to be met with more violence at a destination supposed to be a safe haven? In light of today’s violent events, of attacking asylum seekers and children with tear gas, I find it pertinent to share the project: The Faces of the Invasion. With this collection of portraits featuring mothers and children, it has been my hope to unmask the bigotry behind the caravan advertising, by essentially putting a face on these “invaders”. Let us all be reminded that these are our fellow human beings, who just like us want their unalienable right to life, liberty, and the pursuit of happiness. Once we have seen and realized that, let’s treat them as brothers and sisters, as our mothers and children, as our grandparents and neighbors.